It’s the final days of registration renewal for 2019 for the CLPNA’s members before the December 31 deadline. Members may begin the 2019 Registration Renewal application by logging into to myCLPNA.com. Only those individuals with a current CLPNA Practice Permit are authorized to work as an LPN in Alberta or use the regulated title ‘Licensed Practical Nurse’ or ‘LPN’ as stated in Schedule 10 of the Health Professions Act and Section 12 of the LPN Profession Regulation. Working as an LPN with an expired or invalid Practice Permit is considered unprofessional conduct and may subject the individual to disciplinary action, including fines of $500 and up. Associate (non-practicing) memberships are $50/year including a CARE magazine subscription and practice updates. It does not allow the individual to work as an LPN in Alberta. 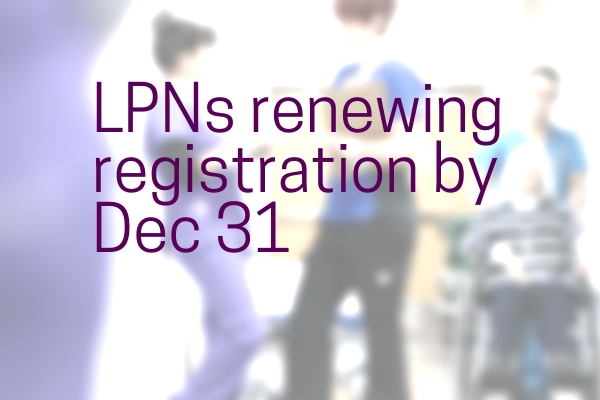 Those LPNs not renewing are advised to notify CLPNA on their 2019 Registration Renewal application. Those still wishing to register after Dec. 31 must complete the Reinstatement process online. As the database is evolving there will be more information on the reinstatement process available closer to January 1. The CLPNA’s Public Registry of LPNs shows current and future registration status, specialties and restrictions. Contact CLPNA at registration@clpna.com, 780-484-8886, or toll-free at 1-800-661-5877 (toll free in Alberta only).